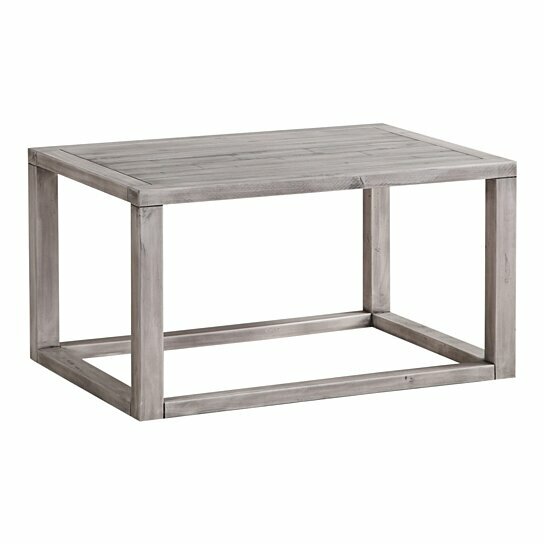 Bring a touch of rustic modern aesthetic to your space with this Coffee Table. Crafted from solid new pine wood in a weathered gray finish, this table has a simple and minimalist design that makes it an ideal piece for any modern aesthetic, or farmhouse aesthetic. Its open base gives way to a spacious plank style top and provides ample space for coffee mugs or other beverage glasses as well as plates for meals-on-the-go and electronic devices. Set this coffee table at the center of your living room and create a striking look in your home. Note: Other featured items in image except this coffee table are sold separately. The table features a simple and minimalist box shape design. It spacious plank style top is ideal to place your decors and set your drinks.